London Pride is back! 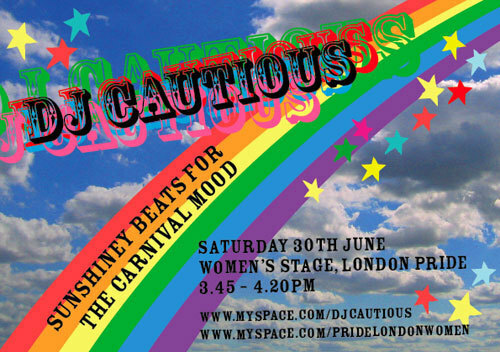 And what better way to see in the celebrations, than getting to know the brilliant and frankly rather pretty DJ Cautious. She's on the women's stage from 3.40. So, DJ Cautious, What Do You Do In The Real World? I drink tea and make a mess in my bedroom. Sometimes I do the creative concepts and marketing for sustainable design projects. Ooh, funky, happy dancy house. Nothing too complicated or pretentious! DJ Tocadisco is my hero... I wanted to play like him for so long after I began. He's gone a bit serious dirty electro now, but there's still a place in my heart for him. Apart from him, the kind of sounds I like are the Freemasons, Axwell's done some fab indie remixes, and you can't go wrong with a bit of Martijn ten Velden, even if he is a bit dark sometimes. Where Can We Hear / See You Next? Pride! I'm on the women's stage from 3.45. I'm so excited! It's by the Candy Bar in Soho so grab a plastic whistle and come down! What's The Big Game Plan For DJ Cautious? Where would you most like to DJ? I was offered a gig at a festival in Australia which would have been amazing. Ibiza would also be awesome, but probably my dream is to be on a float at Pride. I'm on a stage there this year, so fingers crossed for next year. Best gig? Tocadisco at Club Muschi in Cologne. Daytime clubbing in the sunshine, completely sober, just brilliant music and dancing for eight hours straight... if you can dance without drinking for that long you know it's good. I like the one where I accidentally stole another DJ's punters cos my set drew them in. And making friends with Jono from Above & Beyond on the night bus was cool. Also I got my Soho slot by gatecrashing the decks... And Kelly Osbourne quite likes my stuff too! Recommend One Album To Our Readers You Don't Think They Will Have Discovered. Albums? I don't actually listen to albums, just tracks... and then there are so many! There's a really obscure tune called 'If' by School which is amazing French house, and one of my favourite tunes of all time is the Narcotic remix of 'Stand Up' by Lovetribe. Oh yes and can I mention 'Lemon Sherbert' by Jon Guard? People might be able to get hold of that one. Why Should Londonist Readers Go And See You? Cos they want to dance and have a good time, even if they're not total househeads. I try and make my sets so anyone can into them without playing the really obvious naff chart stuff. Venue To Play In London? Venue To Go To In London? So many! We've just discovered Bradley's Spanish Bar, and I love the Glass Bar. Erm... Primark?? Or Harmony in Soho, haha. You always get good peacefully crazy people on the buses in South London. Or the goths in Camden! Place For A Post-gig Kebab? The top floor of the Hilton on Park Lane is fantastic... they weren't allowed to make the hotel any higher cos you would have been able to see into the Queen's garden. Call me pikey, but the bus is always warm and comforting. Keep on the eco thing, dude, you rule! Oh, but I could ask him to put on more number 25 buses so I don't have my face wedged in a man's armpit for 20 minutes. Maybe the giant gold Freddie Mercury outside the Dominion Theatre. He is London's official meeting point. The world is ending in 24 hours??? Why didn't anyone tell me?? Let's blow all our cash at Lucky Voice karaoke in Soho, and nourish ourselves with sushi and dim sum. And then let's have our last ever mobile clubbing... oh please world don't end! No I haven't, thank you very much. I remain dignified and ladylike at all times. As long as I'm not falling down the gap. If You Could Sink One Part Of London Into The Sea, Which Bit Would It Be? I think my best friends would thank me if I requested Catford. Greatest Thing Ever To Come Out Of London? That whale that swam up the Thames was probably the biggest... poor whale. Erm, I can't seem to think of anything that has come out of London... we seem to do better at discovering tiny cool things from different corners of the globe and making them available to everyone. What Advice Would You Give To Someone New To London Getting On A Night Bus For The First Time? Don't worry, it's not half as bad as people say it is. As long as you don't fall asleep and wake up in Hither Green. artwork by DJ Cautious. Email her here.